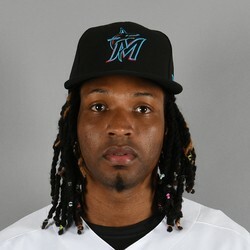 While Urena allowed four runs over five innings, reliever Wei-Yin Chen allowed 10 runs over the next two innings in a game the Marlins went on to lose 14-0. Urena is not off to a strong start as he now owns a 9.22 ERA and three losses through his first three starts. Even if he turns things around, his ceiling is somewhat limited by his surrounding cast on the rebuilding Marlins. Urena has now allowed five earned runs and lasted fewer than five innings in both of his starts this season, both losses. With those results, a weak roster around him, and his reputation as someone who will not strike out a ton of batters, he does not have much fantasy value outside of deeper formats. Urena is not a good option when it comes to filling out your pitching spots in your fantasy league. There are far better arms out there that will provide much higher quality numbers than what you'll see from him. Jose Urena allowed a run on three hits and a walk with four strikeouts over five innings against the Phillies Sunday to pick up the win. Urena has now won each of his last three starts, and he's 4-0 over his last five appearances. He's allowed one earned run in each of those four wins, moving his ERA and WHIP on the season to 4.21 and 1.19.